Normally running adprep /rodcprep at the command line would correct the issues but in this case we kept getting the same response when running adprep. Adprep detected the operation on partition DC=ForestDnsZones,DC=cosgro,DC=com has been performed. Skipping to next partition. ============================================================================== Adprep detected the operation on partition DC=DomainDnsZones,DC=cosgro,DC=com has been performed. Skipping to next partition. ============================================================================== Adprep detected the operation on partition DC=cosgro,DC=com has been performe d. Skipping to next partition. ============================================================================== Adprep completed without errors. All partitions are updated. See the ADPrep.log in directory C:\Windows\debug\adprep\logs\20130213141646 for more information. And when we re ran DCDiag we would still get the same error. All the online documents say this should of resolved the issues but it had not. The problem was not the ADPrep /rodcprep but the permissions were seen to be to “open” for the Enterprise Domain Controllers Group. The security permissions for this group was set to “full” on the main domain partition. This set of permissions needed to be more restrictive for the group. To fix we needed to open ADSI Edit and reset the permissions on the domain partition. The picture below shows you where the domain partition resides, right click the partition and select properties. Then on the pop up windows select the security tab. 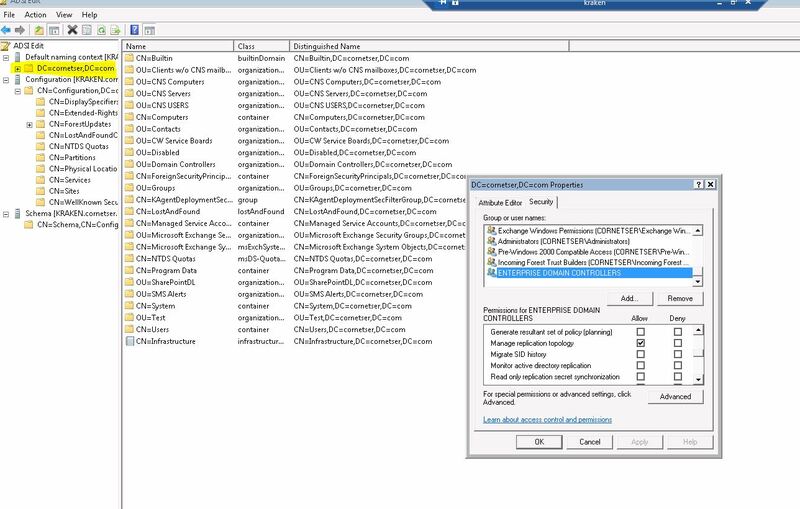 In the Groups and Users box find the “Enterprise Domain Controllers” group and then uncheck all permissions. Now re-add only the list below to the allow column. Apply the changes and rerun DCDiag to verify that the changes are working. Thank You for this article. This has cleared the error! Verified. Works on my 2008 enviroment. I see the same message but on Configuration partition and I do see Enterprise domain controllers has Full control. But how was that applied in first place, isn’t that a default setting ?? Worked perfectly in my environment!